Boulton Family History: Wicked Stepmother? 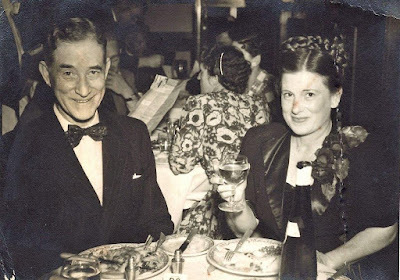 Dr Nigel Boulton's second wife Marie was the widow of James Clayton Tofield, late of Leura, and the daughter of one of his patients Madame Memory, who my family remembers as a very eccentric woman but as an excellent pianist. At some stage Madame Memory was the caretaker of a mansion diagonally opposite the house of Nigel's sister Thea Dennis. From early 1933 Thea lived on the corner of St Vincent’s Rd and River Rd, Greenwich with her five children, one of whom was my mother Julia. In my childhood, when visiting my grandmother Thea, we knew that neighbouring mansion as the Pallister Church of England Girls Home but it was off-limits to us kids and always a bit mysterious. We never saw much sign of any activity happening there. Where were the girls? It’s now the Greenwich Hospital, specialising in palliative care. According to my mother, Marie Ellen Tofield née Memory had long red hair and bred red setter dogs. Nigel married her at the Registrar General’s Office in Sydney on 24 November 1927, when he was close to forty and his boys Philip (Pip) and Peter were about ten and seven years old respectively. In her mid thirties at the time, Marie was inexperienced with children and their needs. In Nigel's divorce from his first wife Mona, custodial rights to the two boys reputedly involved them staying with their father until the age of 14, when they were allowed to choose which parent they wished to live with. At this point, in the early-mid 1930s, both boys were placed in an invidious position by their step mother Marie, who reportedly took them aside and said she would leave their father if they chose to stay with him. They were thus given little choice but to choose their mother, which broke Nigel's heart, especially as his second wife Marie left anyway, a few years later. The two Boulton boys sometimes found it difficult living in the home of their mother Mona and stepfather (Alphons James Dee) and, in his mid-teens, Peter (born in 1920) spent long periods living with his aunt Thea and his cousins (my mother Julia and her four brothers). His older brother Pip sailed off to Europe in May 1939. During one of these periods, when Marie rented a holiday cottage at Patonga for 4-5 days, Peter came to stay with his father and step-mother, bringing a friend, and cousin Julia came too, with a friend. But the food was rationed out, even the biscuits were counted to make sure no-one ate anything additional to the rations. Cousins Peter and Julia long afterwards remembered how starved they felt and how they wished they could go home. Nigel eventually divorced his long-absent wife Marie in 1950. He found happiness with his third wife, another widow. Thelma Attwood née Robertson, a well-known antiques auctioneer, married Nigel at St Stephen's, Macquarie St in Sydney on 19 January 1951. Marie reverted to her maiden name and her death at Sydney Hospital on 24 May 1964 was registered as Marian Memory. She would have been around 72 years old. Nigel died at his home in Ryde on 30 June 1969, aged 80. There is a street in Ryde named Memory St but I don’t know its history or possible connection to Nigel’s second wife and her family. There's a great deal more about Nigel Boulton's life in my book 'Brothers in Arms: The Great War Letters of Captain Nigel Boulton, R.A.M.C. 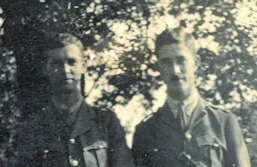 and Lieut Stephen Boulton, A.I.F. '.